Offered for sale with NO ONWARD CHAIN and having views over Exmouth from the front is this 3 bedroom detached bungalow with a private and Southerly facing rear garden. This gas centrally heated and uPVC double glazed property comprises of dual aspect living / dining room, kitchen, 3 bedrooms and bathroom. 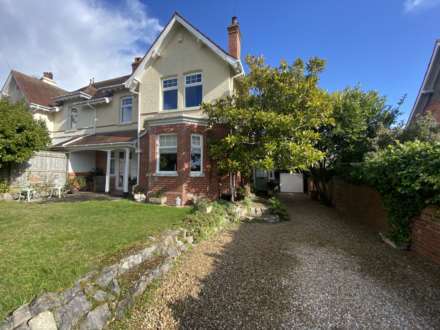 There is a large front garden, driveway for 3 motor vehicles, single garage and the private rear garden. Now in need of updating, but situated on a bus route, an appointment to view is advised. Offered for sale with NO ONWARD CHAIN and having views over Exmouth from the front is this 3 bedroom detached bungalow with a private rear garden. This gas centrally heated and uPVC double glazed property comprises of dual aspect living / dining room, kitchen, 3 bedrooms and bathroom. There is a large front garden, driveway for 3 motor vehicles, single garage and the private rear garden. Now in need of updating, but situated on a bus route, an appointment to view is advised. Access to insulated and part boarded loft space. Airing cupboard housing the gas fired boiler and the hot water tank, with slatted shelving. 2 Smoke alarm`s. Wall mounted central heating thermostat. Radiator. Doors leading to all rooms. Dual aspect having window to side and 2 windows to front gaining open views over Exmouth. Fitted coal effect gas fire within a fireplace surround. Radiator. TV point. Telephone point. uPVC double glazed external door to side with window adjacent. Range of cupboard and drawer storage units with roll edged work surfaces and tiled splash backs. Composite one and a half bowl sink and single drainer unit with mixer tap and waste disposal unit. Built - in 4 ring electric hob with electric oven below and filter hood above. Integrated fridge and freezer. The slimline dishwasher and washer/dryer in situ are included in the sale. Radiator. Window to rear. Range of wardrobes and drawer storage units. Radiator. Obscure glazed window to side. Modern coloured suite comprising panelled bath with electric shower unit over and tiled to ceiling height, low level WC and pedestal wash hand basin. Radiator. The private Rear Garden faces in a Southerly direction and has a patio area immediately adjacent to the property being ideal for outdoor dining and sitting during the fine weather. The remainder is then laid to lawn with shrub and herbaceous beds and borders. Hedge screen to rear with timber panelled fencing to either side. Outside water tap. Outside lighting. Timber garden shed. Front pedestrian access to either side of property via timber garden gates. From Exmouth Town Centre, proceed into Exeter Road and take a right hand turning into Hulham Road signposted Honiton and Ottery St Mary. Continue up Hulham Road until you reach a mini roundabout and turn right into Pound Lane. Take the second left into The Marles, where the property can be found towards the end of the road, on the right hand side, clearly identified by our For Sale sign.